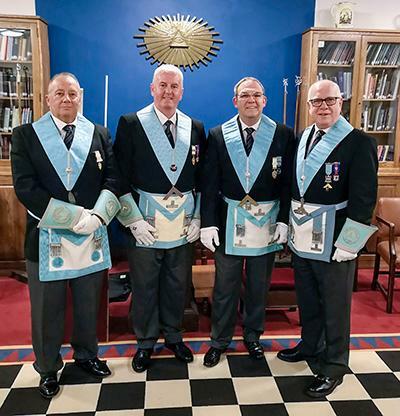 "As Worshipful Master for the current year I am very proud to be able to launch this new website on behalf of the members of our wonderful lodge. "Page Lodge places heavy emphasis on the inclusion of our families in what we do. Our wives and partners are an integral part of our Masonic lives and thoroughly enjoy the many social aspects of the Masonic year. "Please enjoy looking around our website - it will be regularly updated with news, features and pictures that will announce, report and, hopefully entertain. Please 'bookmark' us now and make a point of visiting us on a regular basis. A warm welcome awaits Masonic visitors as are applications for membership". W. Bro. Philip Abram is pictured here (second from left) with (from left to right) Bro. Stephen Holmes, Junior Warden, W. Bro. David Brown (Immediate Past Master), and W. Bro. Brian Chambers, Senior Warden. If you wish to contact us for any reason, we'll be delighted to hear from you - please use the contact form on the 'Contact Us' page. N.B. 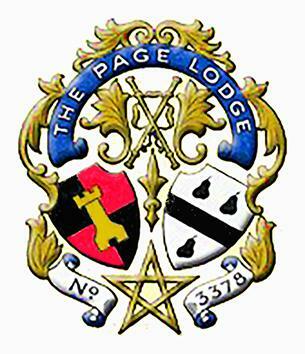 The Page Lodge does not guarantee that websites accessed by links on this page are either Masonic in nature, or have been approved or endorsed by the United Grand Lodge of England. We specifically do not warrant that any other websites accessible from their pages are recognised by, or have the approval of, the United Grand Lodge of England.